Lady Candy and owner Emily Huyke. 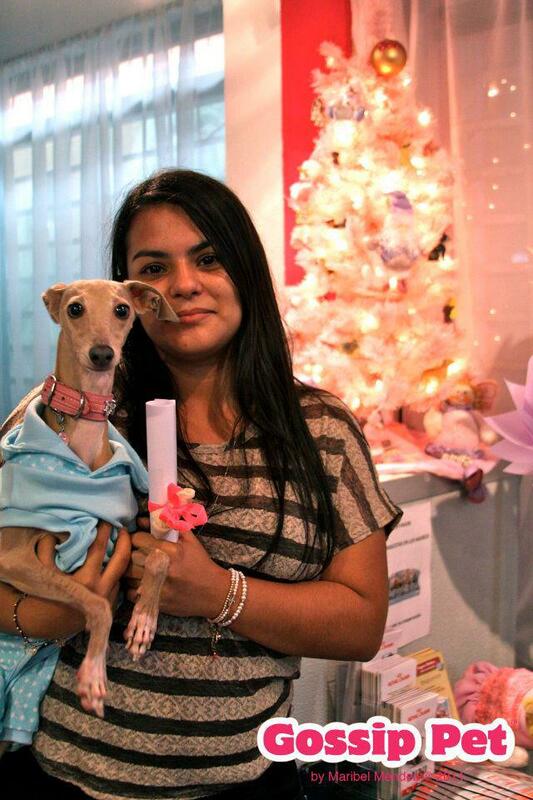 Congratulations go out to Lady Candy, an Italian Greyhound living in San Juan, Puerto Rico for winning this year’s Posh Puppy Boutique Halloween Photo Contest. Lady Candy (and owner Emily Huyke) was the top vote getter from 63 participants. Friends, family and others cast nearly 4,000 total votes on Facebook. 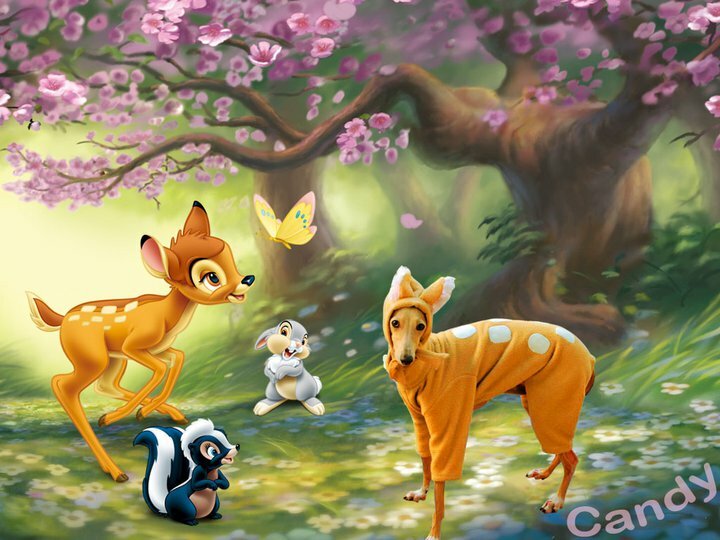 Lady Candy won in her Feline, Bambi’s girlfriend, costume. “I picked that costume because since she was a puppy family members would say she looked like a deer and I just thought it would be really funny to dress her as one,” Emily said. The costume was custom made for Candy. Lady Candy is 2 years and 8 months old, joining Emily as a young pup after Emily had been "dog less" for five years. On the verge of giving up her search for another Italian Greyhound, Emily found a just-placed online ad for a breeder with some pups. Candy loves fetching, running very fast, playing with her human and doggie friends, going to doggie events, car rides and snuggling. She also likes to dress up. She is a local model in San Juan, dressing up for events such as fashion shows, photo shoots and contests. “She gets excited every time I take out clothes because she knows we are going out,” Emily explained. Being an unusual size, most of Candy’s clothes come directly from designers such as Ivette Maldonado, who lives in San Juan. Other brands include Lovely Dog and Wooflink. Now that Emily has her $250 Posh Puppy gift certificate, part of it will be spent on the Designer Charm Step-in Harnesses and a leopard and red dress by Wooflink. 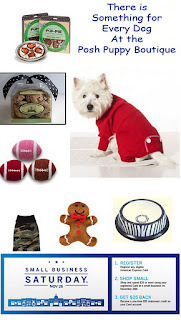 Emily is now shopping at the Posh Puppy Boutique because of our variety in styles, prices and sizes. Perhaps your dog can be the Posh Puppy Boutique Photo Contest Winner. Check back frequently for details on our next contest. In the meantime, call us at 888-837-5230 with any questions, visit us online at the Posh Puppy Boutique or follow us on Facebook and Twitter. One of our many Thanksgiving dog dresses. Impress every Thanksgiving guest by having your superbly dressed four-legged greeter meet them wearing a new outfit from the Posh Puppy Boutique. Girl dogs will have the perfect Thanksgiving look when your guests arrive, especially when you dress her in this Pumpkin Halter Dress ($60). Designed for small to medium dogs, a bright bow highlights this halter. For an even brighter option, consider our Pumpkin Orange Skirt Dress ($60) with its bright orange skirt and yellow bow (in extra-small only). · The Autumn Harvest Dress ($60) comes in small and medium sizes. · The Autumn Harvest Orange Skirt ($60) is available in extra-small only. · The Leaves Halter Dress ($60) is available in sizes from extra-small to medium. Teacups, tiny dogs and even some cats will like our Autumn Elegance Dog Dress ($60) made with beautiful bronze satin and belted with a gold satin ribbon. It comes in sizes from triple extra-small to small. For a distinctively different look, consider our Blue Fall Dog Dress ($75), which is also suitable for toy and tiny breeds (and some cats). It has bright orange, brown and white ric rac trim and a bright orange grosgrain ribbon and bow. It is available in sizes from triple extra-small to medium. When it comes time to enjoy your Thanksgiving feast, don’t forget your bigger buddies. Our Gobble Bandana ($20) fits dogs from small to large. Made from 100 percent Turkish cotton and prewashed, your dog will love this Made in the USA decoration. Girl dogs may get all the all attention but the boys can have some fun too. Dress them in an olive colored Gobble Gobble Tank ($19) then hide the turkey. It fits dogs from double extra-small to double extra-large. All of these options and more—including Thanksgiving-themed dog collars—are available at the Posh Puppy Boutique’s Thanksgiving page. In general we know that a fence is made for privacy and to keep out animals from entering your property. And the things change slightly when you have a pet like a dog, then you need a fencing system that will prevent the dog from running out onto the street and at the same time allow your dog to view what is happening outside the fence. The Pet Peek window fences are attractive and they look good in your garden and at the same time it satisfy your dogs curious need to know what is going outside. These Pet Peek window fences are easily available at any dog boutique. In the Pet Peek window fence there is a small acrylic dome on the fence that allows your pet to see what's going outside. The window is a durable, clear, hard acrylic done 9.5" in diameter with a black trim-ring and all necessary hardware for easy do-it-yourself installation into your wooden or vinyl fence. You can install the Pet Peek window fence by first making a hole over the fence. And once you make the hole in your wall or fence just drill holes for the four screws of the Pet Peek and set it up. If you're not handy will drills and saws, you can call a carpenter to do that for you. And once set your dog can enjoy outside view. Since every dog should have a point of view!! This Scottish Plaid Sweater is machine washable. Our cable knit sweater is available in many sizes. Leaves are falling, temperatures are dropping and winter will soon be rearing its cold, dreary head. What should a fashionable dog do? Why wear a gorgeous sweater from the Posh Puppy Boutique of course. We literally have hundreds of sweaters that will protect and pamper your precious pup in current couture styles. For example, our cable knit sweater ($50) is available in red, light blue, sage green, pink, natural and gray. It is available for almost any dog, coming in sizes from double extra-small to triple extra-large. Hand knit and made from 100 percent wool. We use plant-based dyes so dogs like wearing them. Boy and girl dogs will enjoy our easy care Scottish Plaid sweater ($45) made from black, red and white acrylic. It’s machine washable. Your favorite little princess will look fabulous in this plain, simple and elegant ribbed pink sweater with a big bow ($50) from Puppy Angel. Made with 65 percent acrylic and 35 percent cotton, it has little bows around the turtle neck and a big bow with voile and pearls on the bottom. The sleeves are also trimmed in voile. One of our newest arrivals is this Madeleine Sweater in Grape ($60) and pink ($60). It takes classic styling and adds the hottest fashion, all in 100 percent wool. 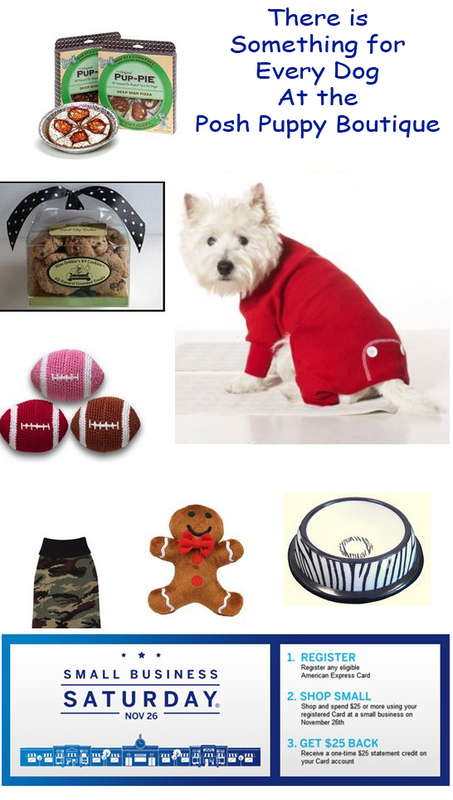 Get a jump on the holidays by dressing your dog in our red Snowman Sweater ($38). Available in sizes from double extra-small to extra-large, this bright red turtleneck has two snowmen on it. It is also machine washable. Make your dog stand out from the pack on your next fall weekend getaway by dressing her or him in our Cashmere Sweater with matching hat and blanket ($130). Available in pink, blue and orange, the caps have a pom while all three pieces are 100 percent cable knit cashmere. 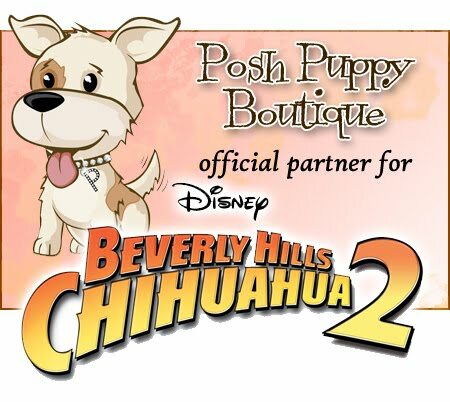 Call us at 888-837-5230 with any questions or visit us online at the Posh Puppy Boutique. Follow us on Facebook and Twitter. Our Butterfly Carrier is one of our40 airline approved pet carriers. Are you planning on taking your pet while jetting off on a holiday trip? If so, it’s best to be prepared by having your pet properly protected. 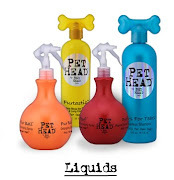 The Posh Puppy Boutique carries a wide assortment of airline approved pet carriers. One example is our Butterfly Carrier ($140) from Pet Flys. It comes in three sizes for dogs up to 16 pounds. The carrier has two interchangeable handles, including one for your shoulder, a “peek-a-boo” roil-up flap, stainless steel wire window, a fur-lined removable hard bottom inset, a blanket and a fur-lined side entrance. It’s also designed to easily buckle into car seats. We also carry several carriers designed with fashion in mind: the Kwigy-Bo Alex and Alexa lines. The Alex line—such as this Camel model ($180) has a plush, quilted animal friendly leather design with silver hardware. In addition to camel, color options include pink, grey, black, black and white, brown, gunmetal snake and black patent croc. Available in small or large, the Alexa carriers—such as this camouflage model priced at $140— have inner and outer storage pockets, a removable quilted comfort pad, side flaps, interior safety strap and nylon linings inside and out. Alexa carriers come in camo, brown nylon and black nylon. Small carriers in both lines measure 15 inches by 5 inches by 8 inches while the large size is 17 inches by 8 inches by 11 inches. ARGO’s Petagon models ($98) in either Tokyo Pink or Maldives Blue are ultra light weight, have five external zipper pockets, a double zipper top and dual layer mesh windows. The small and medium models of our Original Deluxe Carrier ($80) fit comfortably underneath most airline seats. These units have wheel safety straps that slip over handles of rolling luggage, mesh panels on three sides and faux lambskin lining. Our polka dot rain jacket keeps your dog dry and looking great. Rain and snow will not stop any dog when it’s time to GO! So keep your princess or prince nice and dry by dressing them in a fashionable raincoat from the Posh Puppy Boutique. Take a look at our Polka Dot Reflective Rain Jackets ($29) in pink and blue. These waterproof jackets have a drawstring hood, rear leg straps an adjustable waist strap and a reflective stripe on the back so your pet can be seen at night. For a day in the snow or a walk in the rain, protect your dog’s fur with a full-length nylon Rainsuit Coat ($30). It has elastic on the legs to keep your dog’s legs dry and prevent the suit from riding up, a drawstring hood and a removable belly flap plus retro-reflective striping down the sides. It’s available in sizes from extra-small to triple extra-large and in colors including black, brown, navy, pink, purple, red, white and yellow. Add style and color to your pet’s winter wardrobe while also being environmentally responsible by dressing them in a Splash Raincoat ($55). This white with green dots (also available in white and pink plaid) raincoat has a soft waterproof shell made from recycled PET plastic and a printed cotton lining. Smaller dogs will strut their fashion sense by walking in this bright yellow and orange raincoat that will Make You Smile ($110). Lined with flannel, it will also keep your dog warm. It features a classic wrap style design with Velcro fasteners at the collar and tummy. This coat is only available for dogs in sizes triple extra-small to small. Our Mary Dog Raincoat ($200) made from 100 percent polyester Gortex fabric combines comfort and fashion in a purple package. The Poppins Dog Raincoat ($200) is identical, but in pink. Both are available in sizes from extra-small to double extra-large. Since winter is approaching you need to be well prepared! You must have shopped for yourself, but what about your doggie. The first and foremost thing you need to shop for your dog is a dog hat. Since head need to be protected first. And dog’s hat keep your dog’s heads warm since winter is here! No need to worry though, there are Knit Hat available for Dogs at our dog boutique. These dog hats keep your dog warm both inside and outside the house. Some people think that dogs have fur and it will protect them from cold weather. Yes, they do but when weather gets extreme then they too need protection. A well knit hat is a must during this cold weather. Small dogs, short-haired breeds as well as puppies, older and sick dogs need extra protection in cold environments. Do you know that short-haired breeds such as boxers, great Danes, bull terriers and Chihuahuas are especially susceptible to the cold as are puppies and senior dog. We need to thank the sellers who come up with wonderful ideas of products, with which we can now help our dogs stay warm, and let them still enjoy the winter months.